We all knew Manchester was coming. Of course we did. We knew our enemies. We knew how they like to spread terror. We knew just how far they are prepared to go to weaken and eventually destroy our civilisation. We knew that, sooner or later, there would be (another) major terrorist attack on British streets. We didn’t know the precise details, of course, but we knew it was coming. The cold-blooded murder of a number of innocent civilians – mostly teenage girls – was predictable. Terrorists want us to be afraid. They want us to believe that anywhere could be a target, that the next man behaving oddly or woman in a full-body veil is on the verge of blowing him/herself up and taking countless innocents with him. Fear paralyses. Fear causes us to doubt ourselves. Fear … makes it impossible to think rationally and confront an overwhelming threat. And what is more fearsome than random destruction and death? It is fear that will destroy us. From a purely materialistic point of view, the combined firepower of every terrorist group in the world is no match for a single Western power. As painful as every terrorist attack from 9/11 to Manchester were, they were nothing more than pinpricks. But they do not feel like pinpricks. Barring terrorists somehow getting their hands on nuclear or biological weapons – and we know they have been trying to do just that – their ability to hurt us is limited. It is fear that convinces us that that is not true. Terrorists and schoolyard bullies have two things in common. First, they are often very good – instinctively good – at exploiting weaknesses to secure their position. The average classroom bully may not actually bully many children, but he or she will know how to use what bullying he does do to ensure that the other children will defer to him. It may not be nice to watch as a bully bullies, but it’s better than being bullied yourself. Second, they are often very good at convincing people to make excuses for them. The bully had a troubled upbringing, the bully was abused or bullied himself, the bully is too scared to relax … bullies are masters at exploiting such excuses to prevent people in authority from taking action against them. Indeed, it is often easier, in this day and age – when teachers have little true authority to punish a bully – to blame the victim for being victimised. Witness the string of excuses made for terrorists ever since 9/11. If terrorists can present themselves as being justified, with plenty of useful idiots ready to agree that the terrorist is ‘punching up,’ or was somehow provoked, and other such stupidities, they can weaken our resolve to fight back. Bullies do not need to be beaten into bloody pulps to force them to think twice about their actions. What they do need is to have it made clear to them, very clear, that such behaviour will not be tolerated and, more importantly, that their victims will be protected. One does not have to break a bully’s leg to show the sort of firmness that a bully needs to see. Terrorists, too, need to have it made clear to them that terrorism will get them nothing, but unmarked graveyards and eternal humiliation. But this is not easy. It is far easier for those in authority to put their fingers in their ears, pay the danegeld and pretend it doesn’t matter. Our current situation is the result of major political misjudgements stretching all the way back to 1945. It is time to take a good hard look at the problem facing us and move to confront it before it is too late. We cannot co-exist with terrorists. Back in 2001, I stated that – unless something was to change – there were only two possible outcomes to the conflict. First, the election of hard right-wing governments when centre-right and left-wing governments proved unable to cope. These governments would destroy civil liberties in the name of protecting us from terror and, after the terrorist threat was destroyed, continue to seek out new threats to justify their existence. At best, we’d be looking at something akin to Franco’s Spain; at worst, Hitler’s Germany or Stalin’s Russia. Second, the extremists would win. This would be worse. The core problem with groups like AQ, ISIS and even the Taliban is that they have no true sense of governance. Put bluntly, they don’t know when to stop. Nor do they accept defeat, even a defeat mandated by their own rules. They – like every other extremist group throughout history – will keep reinventing the revolution as long as they can, seeking out new enemies to keep their populations from wondering if it is time to lighten up a little. Such groups practice ethnic cleansing, slaughtering everyone who doesn’t share their faith in every detail, mass population control (such as turning women into chattel) and constant brutality to keep the population in line. This would be utterly disastrous for everyone, up to and including the useful idiots. At best, Iran or Saudi Arabia; at worst, Afghanistan, Rwanda or Somalia. Right now, far too many of our politicians believe they can sit on the fence and maintain the balance. They believe they don’t have to make the hard choices. But this has undermined both their position and faith in democracy – if the population believes the elites no longer represent them (a growing trend) why should they vote for them? Why not vote for the parties who promise to deal with a very real threat? Those who gloated about Geert Wilders losing the election on March 15 should, perhaps, be a little more concerned about the vast numbers who voted for him. And, perhaps, just how their attempts to squash Wilders look to voters who no longer feel that their leaders are looking out for them. Our goal must be to defeat our enemies and uphold civilisation, without undermining the fabric of our civilisation. This will not be easy. But it must be done. The alternative is worse. I’m not sure if this is the prologue I’ll use, but I had the scene buzzing through my head. It was a hot summer day when I realised – for the first time – just how vulnerable I truly was. … I hadn’t even managed to cast a single spell. It was a hot month, the hottest on record. My sisters and I would have loved to spend it in the swimming pool or paddling near the beach. Our friends – Alana and Bella’s friends, more accurately – had already decamped, leaving Shallot for their country estates where it would be cooler. We wanted to go with them too, but we hadn’t been allowed to leave. Great Aunt Stregheria had come to stay. I still find it hard to believe that Great Aunt Stregheria was my father’s aunt. She was a tall dark woman, the tallest I’ve ever seen, her hair hanging down in a long braid that signified she was an unmarried woman. It was easy to understand why. I couldn’t help thinking that she looked rather like a vulture, with an angular face and dark eyes that seemed to glitter with malice as she peered down at us from her lofty height. She was one of those unpleasant adults who firmly believed that children should neither be seen nor heard and she hadn’t been shy about making her opinions known. She’d been scathing about my failings in magic. And she’d drilled my sisters in basic manners until even Alana was sick of her. I didn’t know why she bothered to visit us. I still don’t. She complained about everything, from the food to the heat. We were in trouble if we didn’t curtsey just right when she saw us and when we deliberately stayed out of her way. She expected us to wear our formal clothes at all times, even though it was far too hot; she expected to wait on her at table, as if we were common maids. She’d get up late, have a long breakfast and then spend an hour or two with Dad before … well, we didn’t know what she was doing. We didn’t really care either. We just wanted her gone. One day, the hottest day of the summer, we managed to slip away early. Mum didn’t say anything to us, let alone drag us back into the house. By then, I think she was sick and tired of Great Aunt Stregheria making itself at home. She had a home of her own. I rather thought it was a cave somewhere high up the mountainside, but I doubted it. Why couldn’t she go back home and stop bothering us? Great Aunt Stregheria was the sort of person who gave magic-users a bad name. There was a little marshy pond down by the grove, one we’d paddled in when we were younger. We thought it was just far enough from the house – while still being part of the grounds – to escape detection, at least for a while. Dad hadn’t given Great Aunt Stregheria any access to the wards, we thought. She’d have been summoning us all the time if she’d had control. We took off our expensive shoes and splashed through the water, enjoying the cool liquid against our feet. For once, even Alana was too relieved to be away from the witch to indulge in a little malice. We were, just for an hour or two, a normal trio of sisters. Normally, we would have obeyed instantly. But we were hot and sweaty and very – very – tired of her. We didn’t move. Great Aunt Stregheria lifted her hand and cast a spell. I saw a flash of brilliant greenish light, an instant before the spell stuck me – struck us. Alana screamed – I might have screamed too, I’m not sure – as magic flared around her. My skin tingled unpleasantly, as if I was caught in a thunderstorm. I had an instant to see my black hand turning green and warty before the world shrunk. I squeezed my eyes tightly shut as I splashed into the water, then jerked them open as my legs started to move automatically. The tiny pool – so shallow that it barely reached our knees – was suddenly huge. I broke the water, just in time to see Alana and Bella become frogs. My head swam as I grappled with the sudden change. It wasn’t the first time I’d been transfigured, but … but … this was far worse. There were no safeties worked into the spell. I could feel the frog’s mind gnawing away at mine, threading to erode my thoughts. The water was practically hypnotic, pulling at me. If I hadn’t been panicking, if I hadn’t managed to hop out of the water, I might have been lost. The spell on me wore off in an hour, although it wasn’t until two years later that I understood why. By then, Dad had literally thrown Great Aunt Stregheria out of the hall and ordered her never to return. The spell on my sisters lasted nearly a week before it finally collapsed. Dad was delighted, utterly over the moon. He insisted I had a definite magical talent. I had to have something, he reasoned, to escape such a complex spell. Our parents had been unable to unravel it for themselves. I knew better. Alana and Bella had been trapped, but neither of them had been in any danger of losing themselves in an animal’s mind. Their magic had even fought the spell when it was first cast. But I had no magic to defend myself. The protective spells Mum and Dad had given me had never been anchored properly because there was nothing for them to anchor too. It was sheer luck that I’d survived long enough for the spell to unravel. I was defenceless. Anyone could cast a spell on me. It was a lesson I should never have forgotten. I was a zero. And being powerless was my curse. Emily’s New Learning has been good for Beneficence. A true golden age appears to be on hand. But all is not well. The city’s largest businessman may be on the verge of collapse and there are rumours that one of the Great Gods has returned. The streets are on edge. This is a story of two villages. Once upon a time, in two villages – we’ll call them Alpha and Beta – there were two teenage boys who were charged with guarding the sheep. Only one boy from each village could be spared for this very important duty because it was a hardscrabble life – every man, woman and child needed to work to ensure the village could survive the winter. And it was an important duty because everyone knew there were wolves in the mountains. If the wolves killed the sheep, the villagers would starve. One day, those two boys – in their separate fields – decided to play a joke. They cried WOLF! There was instant pandemonium! The villagers dropped their tools, grabbed their weapons and ran for the fields. And when they got there, the villagers each found the boy laughing at them. He showed no remorse at all for his little joke. In Alpha, the boy was severely punished. He was thrashed by his father, scolded by his mother and shunned by the rest of the village. No one would talk to him, his friends abandoned him, no girl would consider marrying him. Eventually, he left the village in disgrace and was never seen again. The rest of the villagers took note. In Beta, the boy was feted as a hero. Most of the villagers thought the joke was funny – “boys will be boys” – and the ones who didn’t were accused of lacking a sense of humour. He was surrounded by friends; he had no trouble finding a girl willing to marry him. His life seemed perfect. And the rest of the villages took note of that too. Over the next few weeks, the mountains surrounding Alpha were quiet. But the mountains surrounding Beta constantly echoed with the cry of WOLF! At first, the villagers would rush to arms the moment they heard the dreaded cry and hurry to defend their flocks; later, they would ignore the cry, reasoning that it was just another young boy trying to cement his position amongst his peers. A handful of villagers swapped homes – some thought that Alpha had been too harsh, others that Beta had been too lenient. And then, one day, the cry of WOLF was heard in both villages. In Alpha, the villagers rushed to arms – they raced to the field, caught the wolf and killed him. The sheep were safe. In Beta, the villagers ignored the cry. The wolf ate the shepherd, the sheep and slunk away happy. Eventually, when someone realised that the shepherd hadn’t come home and went to check on him, they discovered the truth. But by then it was too late. The Alpha villagers lived happily ever after. The Beta villagers starved to death. One pattern I noticed was simple. A group of posters – I thought of them as trolls – would target another poster and harass him mercilessly. They’d pick his posts apart for evidence of wrongthink – sexism, racism, whatever – and accuse him of being sexist (or racist or whatever). Everything their victim said would be taken completely out of context and used against him. He couldn’t say a single thing without getting dogpiled by five or six trolls. Instead of being proved guilty, he was put in a place where he had to prove his innocence. And you can’t prove a negative. This was seen as de facto proof he was guilty. Some of their victims learnt to ignore the trolls. They made liberal use of ignore lists to make sure they didn’t have to read trolling statements. The trolls who had a track record of this harassment could be banned, if they went too far. But this was never easy. The victim might feel that he was under constant attack, but it was difficult to prove. Others buckled under the pressure of concentrated attack. They snapped, either leaving the forums or lashing out at their tormentors. When they did, the tormentors used their words to convince the admin to ban the victim. (This is the same kind of treatment that leads to the ‘they’re all against me’ mentality.) The trolls chalked up another victory and moved on. I see something like this in the constant attacks on President Trump. Trump has been attacked ever since taking the Oath of Office. (He didn’t get the customary 100 days grace.) Every day brings word of a new scandal, a new problem that will end Trump’s Presidency before it can fairly begin. Every new scandal is the worst scandal in all of American history … just like all the others before it. Very few of these scandals have lasted long, but they have wasted Trump’s energy in responding to them. Over the last couple of weeks, Trump has been blasted for firing Comey. You know, the same Comey the Democrats wanted fired a day before Trump canned him? Trump was a bad guy for not sacking Comey and now Trump’s a bad guy for sacking Comey – is it too much to ask, really, for a little consistency? And then we have the suggestion that Trump fired Comey because Comey refused to end the investigation into Russian hacking. I’m no expect, but (according to people who are) that makes Comey complicit in a crime himself. If Trump made an illegal request, it was Comey’s duty to report it. But this is the first we’re hearing of the accusation … what does that tell us? Well, nothing … apart from the fact that Trump’s firing of Comey was entirely defensible. Comey just covered up a federal crime! The problem with being President is this. No matter what you do, there will be people who’ll hate it. There will also be people who’ll expect you to bring world peace, somehow please everyone and be all things to all men. These people will not understand that things take time, that it can take months or years for a new president’s policies to take effect. (Or, for that matter, that there will always be teething troubles. And, when these people are outright enemies, the slightest setback is magnified into complete disaster. If Trump does 100 things – and 99 of them are great successes – you can bet good money that his enemies will focus on the odd one out. Trump will be forced to spend more time defending his lone failure – because admitting a failure normally means political disaster these days – than touting his successes. … And, if your sole response to a political move is hysterical screeching about impending disaster, why do you expect anyone to take you seriously? I am not a military vet. But, in the course of my career as a writer of MIL-SF (among other things), I have corresponded with many real veterans who have been happy to offer me insights into military life. I have also read countless books written by veterans, from personal stories to campaign histories and overviews. One thing that most veterans have in common, at least in my experience, is a complete distrust of the media. They saw reporters as the enemy. And this wasn’t actually a bad attitude. The vast majority of reporters – particularly the ones who weren’t embedded – had a habit of publishing before they got the full story, obscuring what had actually happened. Worse, they insisted on portraying soldiers and their enemies as morally equal, even though one side was clearly willing to use the most barbaric methods to gain tactical advantages and the other operated under heavy restraint. The military took a beating because the generals back home would respond to the media rather than the troops in the field. Worst of all, their lack of context made it impossible for them to understand the realities in the field. The military was held to an impossible standard, which – obviously – it couldn’t meet. And then it got slammed for failing to meet it. Over the last few years, I’ve seen this attitude move more and more into civilian life, both in America and Britain. The media is seen as biased and is, therefore, no longer trusted. Obama and Hillary Clinton had their scandals buried as much as possible, while Republicans who weren’t impossibly perfect were attacked every time they made a gaffe. This worked very well for the Democrats. Any potential GOP candidate who might prove a real challenge could be weakened easily, once he made a gaffe. Indeed, as I noted earlier, one of the reasons the GOP base voted for Trump – despite his massive flaws – was that Trump was the first major GOP candidate to defy the media to do its worst. Unfortunately for the media, the internet – and the independent news media, bloggers and suchlike – has undermined their dominance. A lie can still go around the world at terrifying speed, but the rebuttal can move fast too. So too can blog posts exposing matters the MSM won’t touch, from the failures of President Obama to Hillary Clinton’s endless string of scandals. One doesn’t need more than ten minutes on Google to find articles explaining precisely what Hillary did, what laws and rules she broke and why those laws exist in the first place. And, most importantly of all, why she shouldn’t have been allowed to even have a chance at the nomination. This created a problem for Hillary that, I think, she never truly comprehended. 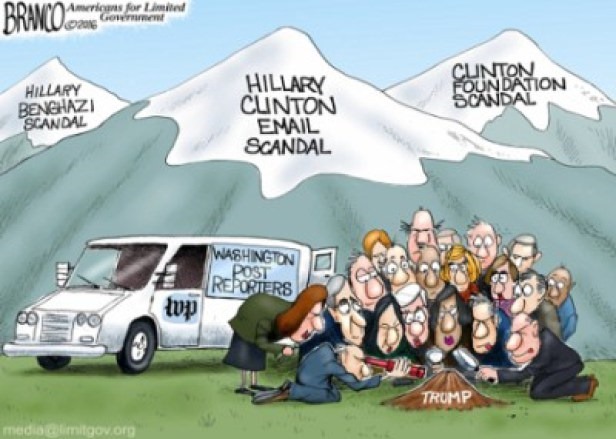 The MSM dampened down her scandals as much as possible, turning her mountains into molehills (and doing the exact opposite for Trump). But, because the MSM no longer enjoyed absolute dominance, the average American promptly did a mental reversal. Clinton’s molehills were actually mountains; Trump’s mountains were actually molehills. And when Clinton had a real molehill and Trump had a real mountain … well … they got switched too. In some ways, this worked out in Trump’s favour. He was seen as the underdog, while Hillary Clinton enjoyed support right across the political, media and entertainment classes. The widespread perception that the media was lying about him – as I bemoaned earlier – made it impossible to properly assess him in any way. And because the MSM is now seen as lying constantly, very few of Trump’s supporters are going to be shaken in their faith. Indeed, they will see Trump’s enemies as the true villains. And, in many ways, they will be right. The morale of ‘The Boy Who Cried Wolf’ is simple. A person who lies constantly will soon develop a reputation for dishonesty, which will ensure that he will not be believed when he is telling the truth. And the morale of my rewriting of the tale is that a community that accepts, justifies, enables and ultimately excuses such lying will eventually suffer because of it. To call President Trump a fascist is simply not that bright. On one hand, it shows a lack of awareness of what fascism actually is. And, on the other, it shows a striking ignorance of people like Putin, Kim Jong-un, Ali Khamenei and Abu Bakr al-Baghdadi. Trump has not gunned down protestors in the streets, taken control of the economy, clamped down on free expression, murdered homosexuals … indeed, if you did a list of ‘evil world leaders,’ Trump would be pretty far down any objective list. It is Trump’s enemies who have acted more like fascists. Attacking his supporters – or anyone who dares to disagree with you – is pretty fascistic. That’s exactly what Hitler used to do. But the more fundamental lesson is this. The MSM has created a situation where its hysterical claims about GOP candidates are simply ignored. Of course they are. The MSM has no credibility left. And the problem with this? When a real fascist comes along, no one will believe the media. Fifteen years or so ago, I went through a Heinlein craze and read a vast number of his books in quick succession. Some offered new insights – Starship Troopers, in particular – while others seemed to have aged poorly or rarely lived up to their promise. Heinlein was both a storyteller and a teacher and the two didn’t always mix. 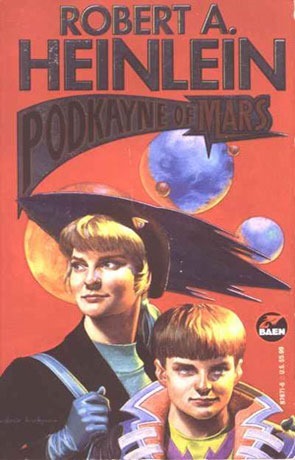 I must have read Podkayne Of Mars during that time, as I have a copy dating back to then in my Baen collection. It didn’t really stick in my mind, for reasons that have also failed to stick in my mind. It wasn’t until I read a harshly negative set of Heinlein reviews that I dug my copy out of storage and read it again. It was, in many ways, an interesting read, even though it has not aged well. Heinlein had far less creative freedom, in many ways, than his modern-day successors. Podkayne Of Mars is a journal, written in first person by Podkayne – Poddy, for short – a fifteen-year-old girl who was born on Mars. Additional information is provided by her nine-year-old brother Clark, who writes his own commentary between chapters.Whatever else can be said of the book, the journal format works remarkably well. Poddy comes across as a living person, a teenager at the point where one is aware of one’s own potential, but less aware of one’s own limitations. That said, Poddy can fairly be described as ‘all heart, no head.’ She is depressingly naive in many ways, always willing to see the best in people … something that eventually gets her killed. Clark, by contrast, is practically the exact opposite – a budding sociopath whose first question is pretty much ‘what’s in it for me?’ The Baen cover captures the difference between the two viewpoint characters very well – Poddy is bright and earnest, while Clark looks sinister and evil. The story starts when a planned family cruise – an interplanetary cruise, naturally – is cancelled by a bureaucratic error which dumps three unplanned babies on the parents without a moment’s notice. Poddy’s Uncle Tom – of whom more below – steps in to arrange for Poddy and Clark to travel with him to Venus, then to Earth. Unknown to Poddy (although perhaps not to Clark) aged Uncle Tom is not doing this out of the goodness of his own heart. He is a diplomat on a secret mission who needs to speak to governments on both Venus and Earth. The children are there to provide him cover. Two-thirds of the book covers the journey from Mars to Venus. Poddy discovers that sexism and classism still holds sway, even though she has a first-class berth on the ship. She meets a number of people who think that all of Mars’s inhabitants are criminals or worse. She occupies her time trying to coax the crew to tell her more about the ship – she has dreams of becoming the first female spacecraft captain – and trying to supervise her brother. On Venus, Poddy and Clark are kidnapped by rogue factions who intend to use them to pressure Uncle Tom into changing his vote. Knowing that Tom will not cooperate, the two attempt an escape. Heinlein’s original version ends with Poddy dying in the escape, the impact of her death shocking Clark and changing him for the better. His editors rebelled against the ending and insisted that he save the poor girl. The Baen edition holds both endings and, realistically, I think the first one is better. It’s easy to see why some readers – looking back from 2017 – don’t think too much of Podkayne Of Mars. Heinlein predicted some things with great accuracy, but other things were flat-out wrong. The idea that women can’t be spacecraft crew – and captains – looks bad to us now. That leaves us seeing Poddy as a strange mixture of innocent and coyly manipulative, using her feminine wiles to get what she wants. If nothing else, this behaviour is not calculated to make anyone actually respect her. Poddy is both charming- she writes in a florid teenage manner – and stupid. She has ambitions, but she never bothers to do what it takes to achieve them. Indeed, she isn’t sure what her ambitions are. And Clark is largely an irredeemable figure. He may, in some ways, be the archetypical Jerk Sue. He is a genius, with a long list of genuinely remarkable achievements. Heinlein may have gone too far in making him heady, as it can be argued he’s too clever. On the other hand, it’s also possible to argue that Clark is nowhere near as clever as he thinks he is – beating the gambling system might have been the result of a system, or sheer luck, or a deliberate decision by the house to let him win. Heinlein doesn’t tell us for sure. On second reading, Uncle Tom – too – comes across as a darker figure. 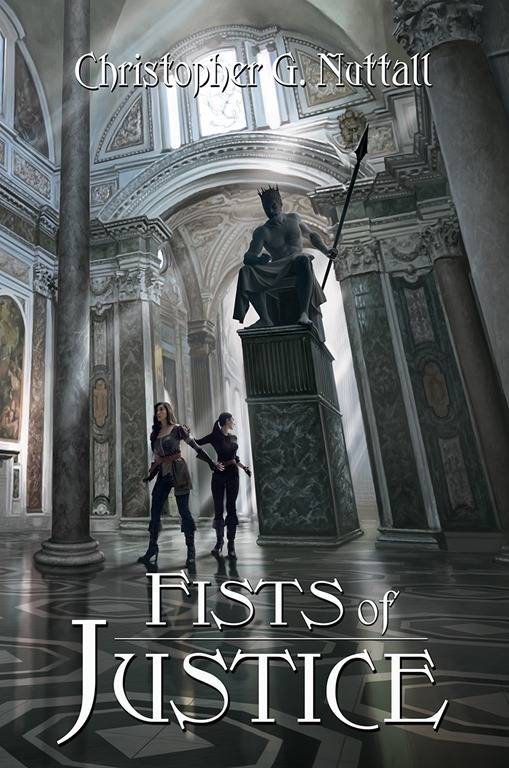 Some reviewers have claimed to spot an incestuous subtext in the book. I don’t see it. Instead, I see a wily old manipulator hiding behind a facade. It isn’t a coincidence, I think, that our true introduction to Tom comes when he applies a merciless dose of blackmail to get what he wants, then uses a naked threat to cover it. His apparent willingness to call out someone for accusing him of blackmail – as in challenging them to a duel – hides quite neatly the simple fact that he is a blackmailer. Throughout the voyage, he uses the children as meat-shields … and, when the chips are down, appears to be willing to sacrifice them to uphold his principles. From a cold point of view, this may be valid; from an emotional point, this is monstrous. That said, Heinlein was very brave for his time. Poddy is a mixed-race child and her parents are considered prime breeding stock, not a very popular attitude. It’s easy for me to portray a mixed-race starship captain or a black girl attending a magic school, but Heinlein didn’t have so much freedom. And – unlike in The Rolling Stones – it’s clear that the mother has a successful career of her own. Poddy’s failure to actually master the tools she needs to get ahead, therefore, looks more like a personal failing than anything inherent to her society. Podkayne Of Mars is, in short, an extended character study of two very different children and their manipulative uncle, rather than a straight story. The story is about how they cope with moving from one society to two very different societies and, in the end, how their personal failings lead to disaster. It is not as entertaining as some of Heinlein’s other works. But it does make you think. It was hard, so hard, to think. The drain was all-consuming, tearing at his mind as if they wanted to pluck his thoughts from his brain-sac. Tash could barely extend his eyes, let alone rise and crawl forward on his tentacles. The deck felt odd beneath him, as if it was on the verge of coming apart. His eyesight was flickering and flaring, fading in and out of existence. He had to focus on each motion just to move … his body was betraying him. They were draining him too. Focus, he told himself. His tentacles lashed the deck, frantically. It should have hurt, but it didn’t. His tentacles were numb. Get to engineering. He stumbled over a body and nearly fell. For a moment, he thought the body had reached out to grab him before realising that his tentacles were spasming. Shame gripped him as he stumbled backwards, an embarrassment that tore at his soul. He hadn’t lost control of himself like that since he’d been a child, dozens of solar cycles ago. Oddly, the shame gave him an opportunity to focus his mind. He had to go on. … Or was it his imagination? It was hard to be sure. Time seemed to blur as he moved down the long corridor. The ship was silent, the emergency alarms silenced. He’d walked the corridors until he’d known them as well as he knew his own nest, but now they’d taken on a nightmarish aspect, as if he was walking through a dream. The lights rose to blinding levels, then faded until they were so dim he could barely see. And there were bodies everywhere, lying where they’d fallen. It was easy to believe that the entire crew was dead. It felt like years before he finally made it to the engineering compartment, decades before he forced the hatch open and crawled inside. Other bodies lay on the deck, utterly unmoving. Tash flinched, despite himself, as his eyes found the engineer. The egg-bearer had been strong in life, respected and feared by the crew. Now, his body seemed shrunken, his tentacles spread out in silent supplication. It hadn’t saved him from them. His mind ached – he thought he heard someone howling. The sound tore at him as he moved over to the nearest console and pressed his tentacles against the reader. There was a long pause, just long enough for him to start fearing that the power was too far gone for the neural link to engage, then the system opened up to him. A status report blinked into his mind, confirming his worst fears. There were no other survivors. He was alone. The howling grew louder, mocking him. His thoughts threatened to fragment, either into their domain or utter madness. Or both … he couldn’t tell if they were real or nothing more than a figment of his imagination. Others had heard them, hadn’t they? He couldn’t swear to it. The madness that had gripped the crew, as soon as they found themselves in this cursed place, made it impossible to trust his own mind. He had no idea why he’d survived when everyone else was dead. He forced his mind into the computers. They opened, recognising his authority as the last surviving crewman. It would have been a heady thought – command at his age – if the situation hadn’t been so serious. The egg-shaper who’d been in command was dead, as were all of his subordinates. And Tash knew it would not be long before he too was dead. The computers felt sluggish, the neural link popping up constant warnings. A power glitch while his mind was within the computers might kill him, or worse. Tash ignored his fears as he surveyed the command network, tracking the power drain. It was growing worse. The computers, thrown back on their own resources, were trying to compensate, but it wasn’t helping. They were draining the ship dry. That’s what they wanted, he told himself. His thoughts were starting to fade. He blanked out, then awoke. They wanted the power. He probed the network, locating the antimatter storage pods. They glimmered in his mind like poisonous jewels, a harsh reminder that their power came with a price. If the containment fields failed, the entire ship would be vaporised. They would be pleased. He forced his mind onwards, isolating the storage pods from the rest of the power grid. It might just be enough to safeguard their cargo from them. There was certainly no evidence that they could just reach out and take the antimatter. … And then the darkness reached out and swallowed him. Paul smiled in genuine amusement. The three of them sat together in his stateroom, finishing a dinner that had been put together by Supreme’s cooks. Paul couldn’t have named half of the dishes before he’d left the Royal Tyre Navy and signed up with the Cavendish Corporation, but he had to admit they were very good. The dinner hadn’t been something he could have afforded, off-duty. Going to a ten-star restaurant cost as much as he made in a month. They made an odd trio, he thought as he surveyed his two subordinates. Jeanette’s face radiated calm authority, her short brown hair framing a dark face that betrayed no hint of vulnerability. Her clothes seemed to diminish her femininity, hiding the shape of her body behind a nicely-tailored blue uniform. Beside her, Raymond Slater looked very much like the sparkplug he’d been before leaving the Marine Corps. His dark face had a certain kind of rugged charm – he’d been ordered to have his scars removed when he’d signed up with the corporation – but he’d never win any beauty awards. Instead, he looked like a man no one would want to mess with. That, Paul knew, was a very good thing. Paul himself looked older than his sixty years. It wasn’t uncommon for older men to have themselves rejuvenated until they looked to be in their mid-twenties, but the corporation’s image experts had insisted that Paul had to look old, wise and dignified. They’d designed him a look – greying hair, grey beard, blue eyes, strong jaw – and convinced his superiors that he should wear it. Paul had a feeling he’d been lucky to keep his muscle tone. The captain of a cruise liner couldn’t go around looking like a bodybuilder, let alone someone who had their muscles touched up every month in a bodyshop. Blasted image experts, he thought, sourly. It wasn’t something he’d had to endure in the military. They’d been far more concerned with beating back the Theocracy, then carrying the war to Ahura Mazda. They’ll put style over substance any day. Paul tapped a switch. A holographic image of Supreme materialised in front of them, hovering over the table. As always, the giant cruise liner – a kilometre from prow to stern – took his breath away. There was none of the crude bluntness that characterised military starships, none of the brutal efficiency he recalled from the navy. Instead, there was an understated elegance that made him smile. Supreme was no warship. She was practically a work of art. He leaned forward, drinking in her lines. The starship was a flattened cylinder, studded with giant portholes … practically windows. Two green blisters – each one easily larger than a naval destroyer – marked the upper gardens; a third blister, blue instead of green, marked the swimming pool. The bridge, a blister on top of the massive starship, made him smile. It looked good, but it was horrendously vulnerable. A military starship could not have such a vital installation in an exposed position. He shrugged, expressively. A cruise liner was not a military starship. He had to keep reminding himself of that. There were just too many differences in everything from purpose to training for him to rest comfortably. The months he’d spent learning the ropes had convinced him that all newcomers required training before they could take up posts on a cruise liner. Perversely, someone who hadn’t been in the military had less to unlearn. And most of the hosting staff don’t need military experience, he thought. They’re civilians through and through. Paul nodded. He’d graduated from the Naval Academy at Piker’s Peak – and Slater had passed through Boot Camp – but Jeanette and the other crewmen had gone through their own intensive training course. The operations crew were as well-trained as many of their naval counterparts, while the host crews had gone through a whole series of simulations and training exercises. Indeed, there had been a surprising amount of cross-training. He could put half the host crew to work on operations if necessary. He’d been astonished, when he’d been given access to the corporation’s files, to discover just how much trouble civilian crews had to handle. Passengers – some of whom were very wealthy and powerful – just didn’t know how to behave. The host crew had to cope with everything from drunken fights to outright misbehaviour, behaviour that would have earned a military officer a spell in the brig followed by a dishonourable discharge. He’d watched some of the exercises and come away with a new sense of appreciation for his crewers. It took a strong man to remain calm in the face of massive provocation. “One of them could be an imposter,” Jeanette commented. He smiled, inwardly. The corporation ran security checks on everyone, from its senior officers and starship crews to third-class passengers. He’d glimpsed enough of the vetting process, when he was being hired, to know that it was almost as comprehensive as anything demanded by the government’s intelligence services. A passenger who might be a problem would be required to spend the trip in a stasis pod, if they were allowed to board at all. It was far more likely that they would simply be denied passage. There were lower-grade passenger starships plying the spacelanes, after all. “The passengers would pitch a fit,” Jeanette commented. He shook his head in wry amusement. Supreme wasn’t just a passenger ship. Travel on her was an experience. She had everything from a casino to a brothel, just to make sure that her passengers travelled in luxury. Even the third-class passengers, the ones who’d be crammed into tiny cabins on the lower decks, would have access to the entertainments. The thought of being recorded, even for security purposes, would horrify them. They’d be worried about blackmail or worse. Paul fought hard to keep his face expressionless. Robert Cavendish was one of the richest men on Tyre, perhaps the richest. Only the king and a handful of other aristocrats came close. He should have been a Duke – and would have been, if he hadn’t been more interested in building his empire. And he was Paul’s ultimate boss. It was a recipe for trouble. He took control of the display, adjusting the hologram to show off the weapons emplacements. Paul couldn’t help feeling that Supreme, for all of her elegance, looked faintly ridiculous. Her design was just too inefficient. But then, a full-sized superdreadnaught wouldn’t win any beauty awards. All that mattered was smashing her enemies as quickly as possible, before they smashed her. Paul exchanged glances with Jeanette. He had some leeway – he could alter course, once they were in hyperspace – but he had to take Supreme to her listed destinations. There was no way he could refuse to go to a particular world unless he had a very good reason. Corporate would be very annoyed with him, even if he could prove the world was under siege. If there was one thing corporations and the military had in common, it was that there was always someone flying a desk who thought he knew better than the man on the spot. Paul groaned, inwardly. The regular uniform was bad enough – whoever had designed their uniforms clearly didn’t have to wear them – but the dress uniforms were worse. His uniform was covered in so much gold braid that he looked like an admiral from a comic opera navy, while the midshipmen and stewards looked like military captains and commanders. He’d never been able to shake the feeling that people were laughing at him behind his back whenever he wore the dress uniform. The idea of commanding a starship while wearing such an outfit was absurd. Paul nodded, stiffly. The host crews kept files on their guests, files that were shared with other host crews. He’d heard they were even shared between corporations, although it was technically against corporate guidelines. An unpleasant passenger would discover that his reputation had preceded him. And a good passenger would have the same experience, he mused. It wasn’t something he wanted to discourage. But in a better way. He sighed, inwardly. It was probably a good sign. He’d seen some of the files. A number of men – powerful men – had been marked as everything from being lousy tippers to having wandering hands. Robert Cavendish wouldn’t have been spared. “I’m sure some of them will feel that way,” Jeanette agreed.